From 7 pm 30 April to 6 am 1st May Florence won’t sleep. Florentines and not, will be up all night long to attend the great event of Florence White Night 2010, entitled Creative Insomnia and promoted by Florence Municipality. Many events, concerts and performances will animate the city. Almost every borough, square and street will have its attractions. Also many museums and buildings will be open, such as Palazzo Vecchio (open till 6 am), Palazzo Strozzi and the art exhbit “De Chirico, Max Ernst, Magritte, Balthus. A look over the invisible” (till 5 am) and the Oblate Library (till 6 am) that will host special events, as well as the Uffizi Gallery open till midnight, Natural History Museums (till 1 am) and Bardini Museum (till 2 am). In the Cure are, along the Mugnone River to Fortezza Da Basso there will be a guided tour discover Florence graffiti from midnight to 6 am. Between Via Palazzuolo and Piazza San Paolino, near Santa Maria Novella Church, there will be many different entertainers and the square will be lighted up from 30 red lanterns powered by solar energy. In Piazza Santa Croce will play a marching band formed by 40-50 percussion that will wander around the borough. And then classic concerts, films, dancing, food and much more all around Florence. It looks like this year it would be fun being sleepless for one night! 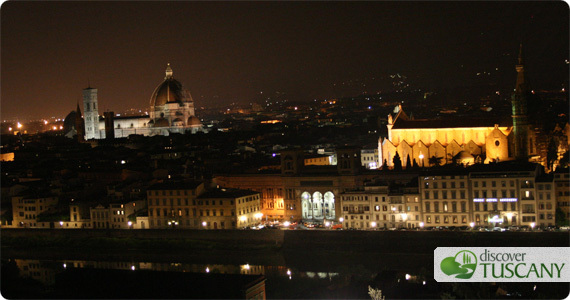 For more information on the official calendar of Florence White Night 2010 you can visit the Italian website Insonnia Creativa.